You've been swindled. At least that's the conclusion I've come to. It wasn't the hucksters or the snake oil salesman. It wasn't big business, big medicine, or some greedy hospital administrator. It was most likely pharma with a large dose of helping from your doctor. Plain and simple. I've learned quite a bit being a hospice medical director. Covering dozens of new admissions a week has given me much insight into doctor prescribing habits. Often it is my job to decide with meds are necessary and covered by hospice, which are necessary but not covered by hospice, and which are useless. Do you have any idea how many useless and often harmful meds our patients are on? I'm not just talking about end of life, but healthy patients to. Can we talk multivitamins? Almost every patient I encounter is prescribed a multivitamin. Healthy, unhealthy, living, dying. When your in the grasps of stage five thousand and one lung cancer and your brain is riddled with mets, you have no business being on a multi. It's not going to help you. It's not going to provide that last bit of energy to overcome the calamitous collapse that is approaching rapidly. In fact, there is plenty of data to suggest multivitamins are harmful if not neutral at best. Even in healthy people. How about Vitamin D? I swear to g-d, every patient I encounter is on some sort of D supplement. Never mind that the vast majority of medical evidence implies that supplementation is unhelpful in most disease processes. Yes, there is osteoporosis, but otherwise, it is a non starter. Aricept in patients who don't walk, don't talk, and barely interact with the world around them? Again, started often because there is no other treatment, profound dementia patients are submitted to a host of side effects including diarrhea and syncope without the faintest glimpse of medical benefit. Vitamin C, Vitamin E, Calcium? How about statins in patients without a history of coronary disease with end stage-opathies and malignant cancers. Do we really think we are going to cut down on cardiac events in the fleeting few months that these patients have to live? Is there any data to support this? You better believe that these patients get myalgia and other side effects. Antibiotics for foul smelling urine, screening urine cultures without symptoms, or agitation in an already agitated patient. It seems that treating non-utis has become the national past time of our healthcare system. I could go on and on. Don't even get me started on antibacterials for non bacterial infections. The point is, we are not being careful with our prescribing habits. We are not taking into consideration the wealth of evidence and data regarding some of these treatments. And we are not being good advocates. 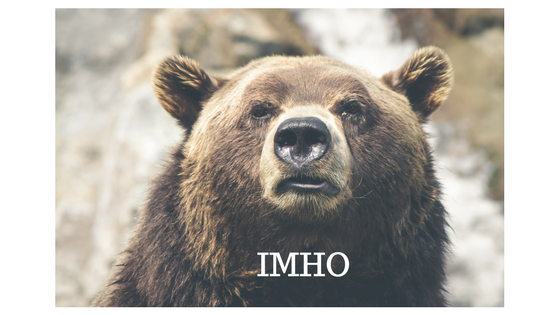 We are not shielding our patients from harm. As Hannah's granddaughter clutched at her skeletal fingers, the blanket fell to the side revealing the faded serial numbers on her forearm. The family gathered, yet again, to say goodbye. This time her acrid breath had lost humidity, her respirations dry and raspy, the extremities mottled with a bluish tinge. Death had visited the neighborhood before. Lounged in the parlor. Nibbled on crackers and tea. But letting go was not so easy. Sure the signs were there. There were the bouts of unconsciousness lasting days. The hours of irregular breathing with long gaps. The clutching of chest and recitation of prayer. All followed by merciless, unrelenting recovery. Why won't you take me? They said she was a survivor. A code they used in order to avoid talking about dark things. Guilty things. She was forever marked by the fact that she didn't succumb. She didn't die. She was scarred somewhere deeper, more profound, than the ugly thing on her forearm. She was marred by persistence. Most of her family died decades ago during the war. A whole lineage erased. And yet she persisted. Her colon removed, her brain stroked, her heart fibrosed. And yet she persisted. The years passed, friends and lovers gone, a child or two perished. And yet she persisted. Persistence had entwined her DNA, calcified her bones, and cascaded past blood cells forever traveling in circles. Her body was failing, but her spirit couldn't let go. 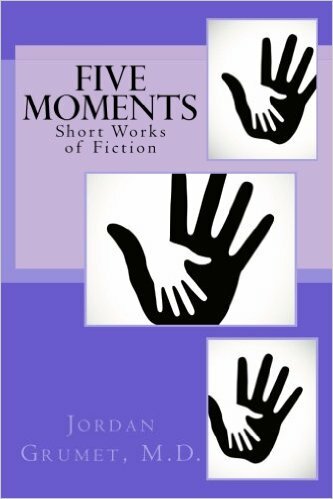 Five Moments, now available on Amazon. 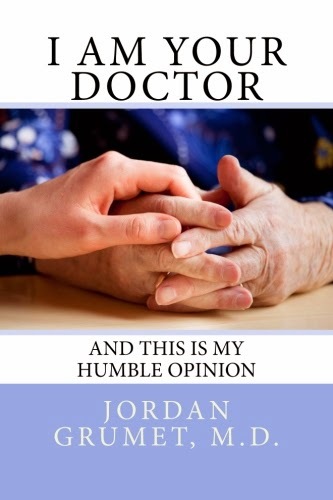 Also available, I Am Your Doctor: and This is My Humble Opinion. It was not so much the words as the overall tone of the interaction. 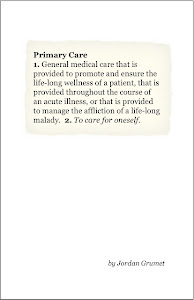 The doctor-patient relationship had been generally affable. There was the usual exchange of pleasantries over the years. Questions about family, children and grandchildren. It was a good relationship. Until Harvey got sick, that is. Originally there was weight loss and fatigue. The initial physical exam and slew of testing showed nothing but a frail, cachectic, middle aged man. A few cat scans later and he was in the oncologist's office discussing chemotherapy. A regimen was decided on, and therapy began the next day. Therapy was hard. Nausea. Retching. More weight loss. Far from feeling better or cured, Harvey could feel the clothes slipping from his emaciated body. It was as if life itself was drip dripping away as the chemo bulldozed into his broken veins. And this pissed Harvey off. He lashed his family. He cursed his friends. He spun into a whirlwind of the most resistant depression. A depression, his therapist would later tell me, whose only salve was anger. While the anger allowed him to carry on, often he left those around him scorched. His doctors were no exception. We often spent half of each visit withstanding abuse before getting down to the business of the appointment. He blamed us for the cancer. He blamed us for the lousy response. He blamed us for the side effects of his abysmal treatment. So when I walked into the hospital room to tell him the scans showed his latest chemotherapy had failed to stem the red tide of death, I have to admit that I had already somewhat detached. How could I not? Although he was fairly lathered by the results, it was the mentioning of hospice that finally led to my expulsion. His wife ran after me with tears in her eyes. I'm quite certain that she paid dearly for her kind act of decorum. I am prone to remember the pleasantries Harvey and I enjoyed before his health deteriorated. I am neither disturbed nor saddened by the anger. I cannot even say that I would not have been the same way if I had been lying in his hospital bed. What surprises me, in retrospect, is how little he affected me. How his anger didn't penetrate the hardened shell. Over my career I have been yelled at, cursed, blamed, hugged, and even loved by my patients. And like the poor life force oozing out of Harvey's beleaguered body, it drip drips down my back. And into a forgotten puddle on the ground. My new book: Five Moments, now available on Amazon. Thomas heard his daughter’s voice from a distance. It awakened him from his reverie. He relived those five moments of life and took their lessons seriously. Rejoice in the ordinary as if you were a child seeing everything for the first time. Unconditional love can lift you up. Forgive yourself over and over again. No matter how much we deny it, we are who we are. Some of the most difficult battles are those in which we choose not to fight. Thomas opened his eyes and smiled. He looked at the faces of his family before him. After all these years he finally got it. He understood the meaning of existence that eluded him till now. Eternity . . . Immortality . . .
His family was now joined by numerous others. Thomas’s friends and colleagues, his patients and students, even the man he once gave a five-dollar bill to on the street. They were all there. He gave a part of himself to each of these people. And each of them had given a part of themselves to others. There were thousands, if not millions, of people in the room with Thomas. His life had meaning. Like a rock falling into a pond, his goodness made a small splash with the people around him. But the waves from the rock rippled throughout the pond. Thomas would live forever. Parts of him were dispersed into the world. And those parts would live and thrive. Thomas’s body was dying but his soul was strong. He felt oneness with his fellow man. For a moment Thomas thought if he just had enough strength he could share this beauty with his family. But then he realized this was not the sort of thing someone could teach. Each person had to experience it himself. Isabella’s word’s came back to him as he drifted off.He remembered sitting on the kitchen floor with his daughter and granddaughter the day she almost choked to death. Thomas experienced one last thing before he died.A cool sensation started at the back of his head and washed over his cheeks, shoulders, body, and into his toes. With pure joy, he recognized this as the first sensation he felt upon exiting the birth canal. Beginning and End. Birth and Death. They were all intermingled in this beautiful dance called Life. Taken from Five Moments, now available on Amazon. And so begins my new book of short fiction, Five Moments. This collection of short stories approaches the foibles of the human condition, often as seen through a physicians view point. Crafted over years, each draws from my experiences as a caregiver, a parent, and human being. During the marketing of my last book, I Am Your Doctor And This Is My Humble Opinion, I found that above all the interviews, reviews, and assorted media-It was you, the reader, who carried the greatest impact. You are the most effective marketing force. Your help is much appreciated. Five Moments can be purchased here. I Am Your Doctor And This Is My humble Opinion here.